I’m currently travelling around the United States of America and I’m going to visit every state in New England. 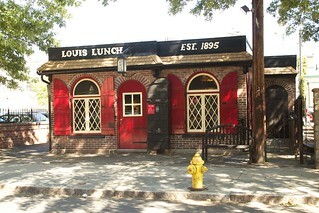 On Tuesday I went to New Haven, Connecticut and one of the reasons was to visit Louis’s Lunch. This place is a shack that serves burgers. More importantly it claims to have served one of the first hamburgers in America around 1900. I discovered the place via Heston Blumenthal’s TV programme on the hamburger where he attempted to create the perfect burger. He visited Louis’ Lunch when he made the programme. The menu is very simple – hamburgers with or without cheese, with or without onion and tomato. And that’s it. 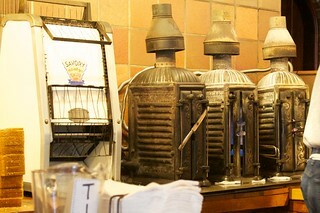 The hamburgers are all cooked fresh to order in some very old looking equipment which I assume are broilers. 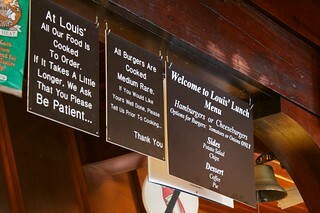 The burgers are cooked vertically and are served in toast, which is the way Louis’s Lunch has always served them. I think there was something on the toast but I don’t think it was butter. The shack has very limited opening hours but they know what they are doing. There were people queuing outside. A local walked past saying “The best burger in America”. It was a very tasty burger indeed. The owners were very friendly, calling me by my name from the moment they took my order. Well worth the visit for this burger I have to say. But please be patient if you go – they do cook to order and it takes a quarter of an hour to get your burger. Posted in Food and RecipesBookmark the permalink.